The most important thing to any serious bodybuilder is that they maximize the benefits of each and every workout session and recovery period. Throughout the years there have been hundreds of books, magazines, articles, tapes, videos and other forms of advice from everyone who ever lifted a dumbbell telling every aspiring weight lifter and serious competitor what they should eat and how they should sleep and the products that claim that they can help you achieve that just keep coming. The question for those who really want to take their training to the next level is simply - how do you know what products are right for you? Are the safe? Are they effective? How can you know? The plain truth is that no one can know just by reading a label or believing what the advertisements say, you have to do your research. And, even though that process can be daunting, it's just like training - there are no shortcuts to success. That's why, as part of our ongoing efforts to help our readers find the products that are right for them we have decided to take a long hard look at one of the most talked about bodybuilding products available on the market today. It's called Natural Sterol Complex. An all-natural anabolic formula, Natural Sterol Complex is a product of Universal Nutrition which has been creating products specifically designed for bodybuilders since the nineteen seventies. This latest formulation claims to be a safe, plant based alternative based on an ingredient list filled with plant sterols, minerals, fatty acids, amino acids and electrolytes to unsafe and often illegal steroids and prohormones. 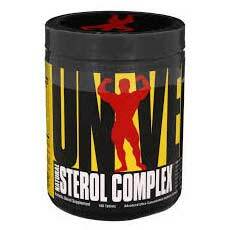 Articles offering advice Natural Sterol Complex is an all-natural anabolic formula manufactured by Universal Nutrition. Universal Nutrition has been creating nutritional products for bodybuilders and athletes since 1977. Natural Sterol Complex sets itself apart from other bodybuilding supplements with its natural formula full of plant sterols, amino acids, electrolytes, fatty acids and minerals. The manufacturers of Natural Sterol Complex state that, due to a highly concentrated formula built the aforementioned natural ingredients provides a high level of anabolic support which leads to greater production of lean muscle mass and shorter, more productive recovery periods, in part, by binding to various estrogen receptors and reducing the conversion of estrogen. Note: The Natural Sterol Complex formula first developed in the mid nineteen nineties has been recently updated for higher levels of potency and effectiveness. The fatty acids and phospholipids added to the new formulation are drawn from soy lecithin and flaxseed powder. As any savvy consumer of bodybuilding products knows, the user reviews associated with an official product website or other advertisement platform are suspect by the very fact that they are approved by the manufacturer or distributor of the product. This being the case, we look for more independent user reviews on platforms that do not have a corporate tie to the product, itself. In our extensive search for truly independent user reviews we discovered that the majority of users who tried Natural Sterol Complex did not have many positive things to say about the product. The most common theme among these negative minded users was the fact that they simply did not experience the type of benefits that the producers of Natural Sterol Complex claimed. Dosage instructions state that the user should take six tablets on training days with meals approximately one half hour before beginning your workout and just two tablets on off days. When it comes to performance enhancing supplements such as Natural Sterol Complex which is designed to alter certain bodily system processes, it is always advisable to first consult with your primary care physician or other qualified medical professional before beginning use. Going back to the opening statement of this review, there is no dispute that the one thing every serious athlete and bodybuilding wants most is to have their workouts and recovery periods provide the maximum benefit. Finding the right bodybuilding supplements that are the most productive at helping to build lean muscle mass while building stamina and endurance to reach maximum gains is difficult in a world where it seems there are new products coming onto the market daily. Still, as discussed, a serious competitor just has to apply the same tough standards to their search for the right product as they do to their workouts. Doing our part to help in this process, once again we have examined one of the most talked about products making a name for itself in the field. And, when we review what we have learned regarding Natural Sterol Complex we found some disappointing results. From the proprietary formula that prevents the user from ever knowing exactly what the real quantities and qualities of the formula are to the more than unfavorable independent user reviews to the higher prices found on the manufacturer's website it is difficult to recommend this product. Granted, there are many similar products that have the same deficiencies but that only means that there are many products who do not either live up to their claims or deserve to be included among the best options for serious bodybuilders and even more serious competitors.